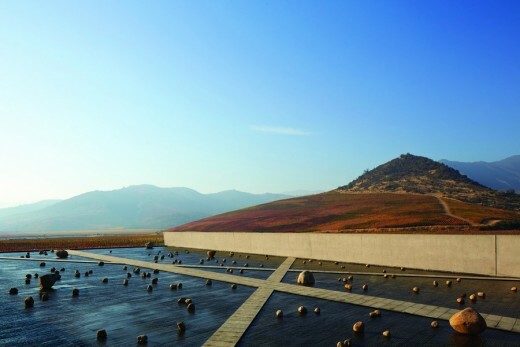 As all Vik Retreat destinations have come to be known, the VIK winery features a unique and unprecedented design, which is at once state-of-the-art, highly sustainable, technologically creative and a stunning visual display which redefines the wine experience. 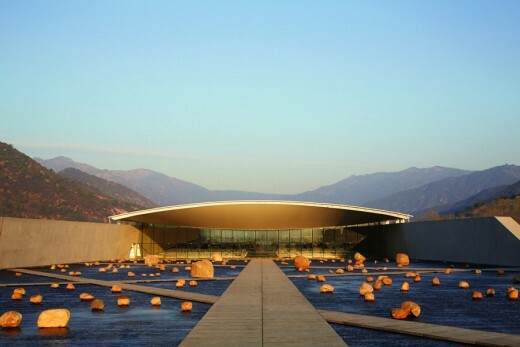 The winery has been designed by the talented Chilean architect Smiljan Radic. 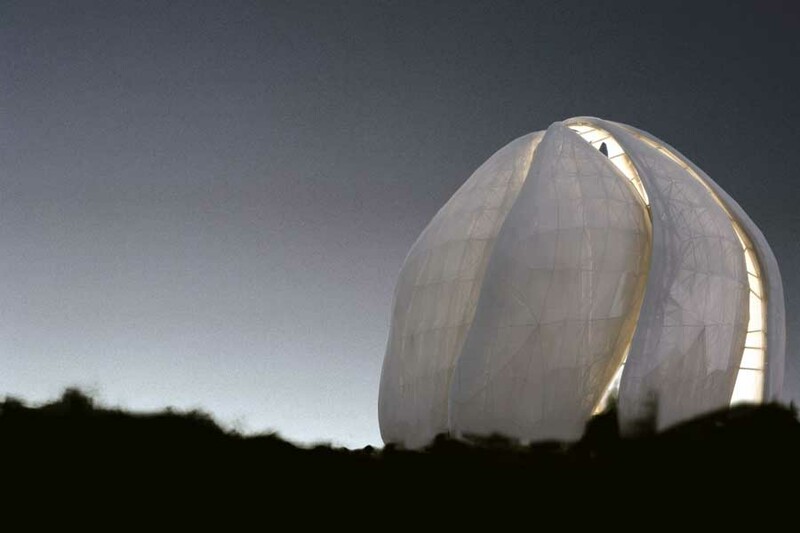 The visionaries behind Vik Retreats, Carrie and Alexander Vik, embarked on an architectural competition of Chilean architects in 2007, which ultimately lead to the selection of Radic (in association with Loreto Lyon) as the principal architect and designer for the inspired and creative winery design. After winning this competition, the VIK team spent three years working to refine and improve the original design concept and materials. Set amongst the sweeping valleys with the soaring Andes mountains in the distance, the winery has been thoughtfully designed to have minimal impact on the landscape and has implemented the most cutting-edge and advanced technology while also striving to create a unique design. 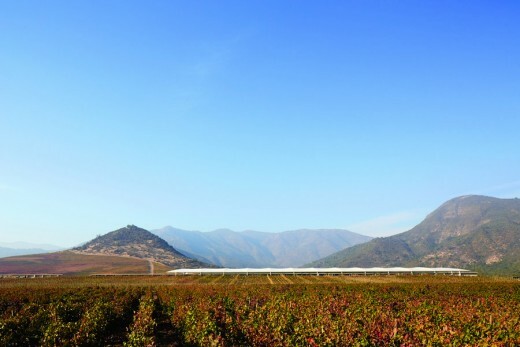 The winery’s design features a uniquely transparent, stretched fabric roof that allows for natural sunlight to permeate the winery and thereby to operate without artificial lighting. 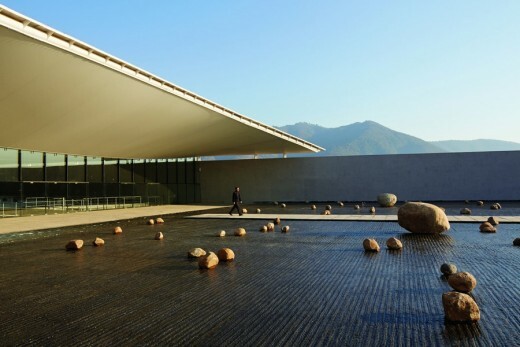 The entrance to the winery is an arresting visual display of a two-degree sloping plaza of running water streaming over the space, which provides an additional cooling element. 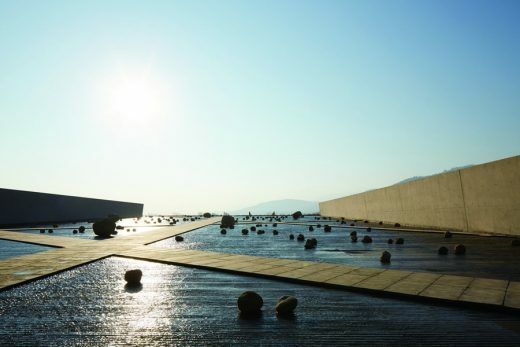 Placed throughout the plaza of the running water is a sculptural installation by Smiljan Radic and Marcela Correa, Chile’s talented husband and wife team. 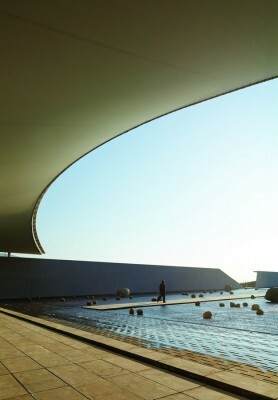 Walkways have been cut into the plaza, allowing visitors to walk through the water-filled landscape. The majority of the building is located underground to naturally cool the wine during the wine making process by maintaining a consistent temperature of 57 degrees using the natural thermal amplitude of the valley. The fabric roof, the primary architectural element which can be seen from the outside, gives the impression of an enormous white wing suspended over this underground winery. Upon entering the interior of the winery, visitors are immediately immersed in the VIK experience, and will be guided through the internal workings of the winery which takes them through the entire wine making process, depending on the season, from crushing and fermentation to barreling, aging and tasting. On the lower level of the fermentation hall with its stainless steel tanks visitors are attracted to the distant wall flooded with natural light and can gaze down the long colonnade of inclined lit columns through the malolactic barrel cellar into the tasting room where the altar of VIK wine sits in this natural light. In the tasting room Patrick Valette, the chief oenologist, or one of his team members presents various aspects of VIK and tastings of the vintages. After a wine tasting, guests have the opportunity to walk upstairs to the glass pavilion to enjoy VIK with culinary indulgences among exceptional design and sculptures by Marcela Correa while viewing the VIK vineyard and winery set in the surrounding majestic nature. Here they can also make their purchase of VIK to enjoy at home with friends and recall their experience in Chile. For more information on the winery and vineyard, please visit www.vik.cl or www.vikretreats.com. Alexander and Carrie Vik, the innovators behind Vik Retreats, are delighted to announce their expansion into Chile with the unveiling of VIK, an unparalleled wine experience and Viña Vik, their latest retreat. The creative force behind some of South America’s most celebrated private retreats, Estancia Vik José Ignacio, Playa Vik José Ignacio, Bahia Vik José Ignacio and La Susana in Uruguay, offers guests a unique perspective into the VIK wine and terroir as well as the culture and art of Chile at their holistic vineyard and retreat. At VIK, holism is a guiding force helping to make a great wine and an extraordinary experience. The philosophy that guides the entire VIK experience centers around the concept that every element, from the diversity of the terroir and natural relationship of the flora and fauna, to the warmth of the Chilean people, come together to create what is a truly innovative and exceptional wine experience. Under the direction of Alexander Vik and Wine Maker Patrick Valette, a team of some of the most knowledgeable and passionate wine professionals have come together with the singular mission to produce the best wine that this exceptional terroir can offer. The goal from inception has been to have VIK join the pantheon of the great wines of the world. The vineyard location in Millahue (in the Mapuche language, “place of gold”) was selected after two years of intense scientific research to find the ideal terroir to grow the best grapes, which would then express themselves in the best wine. The vineyard consists of twelve expansive valleys situated on 11,000 acres of land. The plantation and clonal selection of rootstocks were carefully chosen following more than 4,000 meticulous deep soil studies conducted across the vineyard to ensure that each block of land afforded the optimal growing conditions for each root stock and grape varietal which include Cabernet Sauvignon, Carménère, Syrah, Cabernet Franc and Merlot. Additionally, climate conditions were taken under careful consideration. Weather stations were installed and a team of scientists, wine and agricultural experts intensely researched all elements of the terroir including the diversity of exposures to the sun, wind, soil types and conditions, hydric flows, thermal amplitude and geographic orientation. All of these essential elements further determined the VIK location as the optimal location to grow the perfect grape. Viticultural precision is essential to yielding the highest quality grapes. In order to attain that precision VIK is planted in high density ranging from 3,000 to 4,000 plants per acre with vines planted on the valley floor and on hillsides. The latest technology and machinery is utilized, but more importantly, tremendous care and attention is paid by hand to the differing requirements and needs of each block, parcel and vine while a specially designed irrigation system precisely controls hydric resources for each vine. Grapes at VIK are harvested by hand at night when they are at their optimal natural temperature, insuring that the grapes perform at their best through the selection and crushing process. They are then fermented in stainless steel tanks to maintain the freshness of the fruit and the aromatic precision of the wine. Aging of VIK is conducted in new French barrels, for twenty to twenty-four months, with racking every three months. The VIK wine is world-class and meant for long-term aging. The wine is a blend of Cabernet Sauvignon, Carmenère, Syrah, Cabernet Franc and Merlot, which are blended each year in unique combinations creating a complex, elegant wine with finesse and fresh fruit aromas of cherry, strawberry and plum. At VIK, sustainability is an integral part of the holistic approach to winemaking. The team takes great care to mitigate, recover and improve the natural landscape, with specific measures being taken to maintain the natural equilibrium between the vineyard and the surrounding wilderness and to preserve native wild animals and plants. 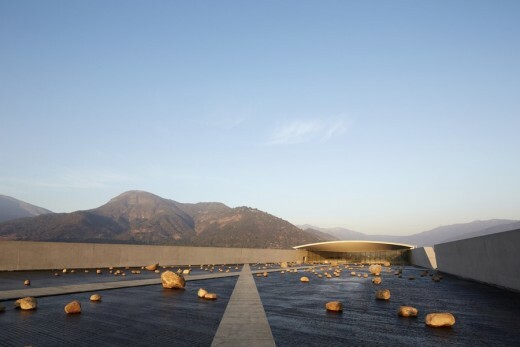 The VIK winery, designed by celebrated Chilean architect Smiljan Radic, who was selected following a lengthy architectural competition of Chile’s best architects, is located at the end of this most beautiful Millahue valley. While visiting the VIK winery, guests enjoy wine tastings and winery tours highlighting the process by which this world class wine is created and the winery’s design of utilizing the most innovative and advanced technologies to create an exceptionally efficient and green winery. 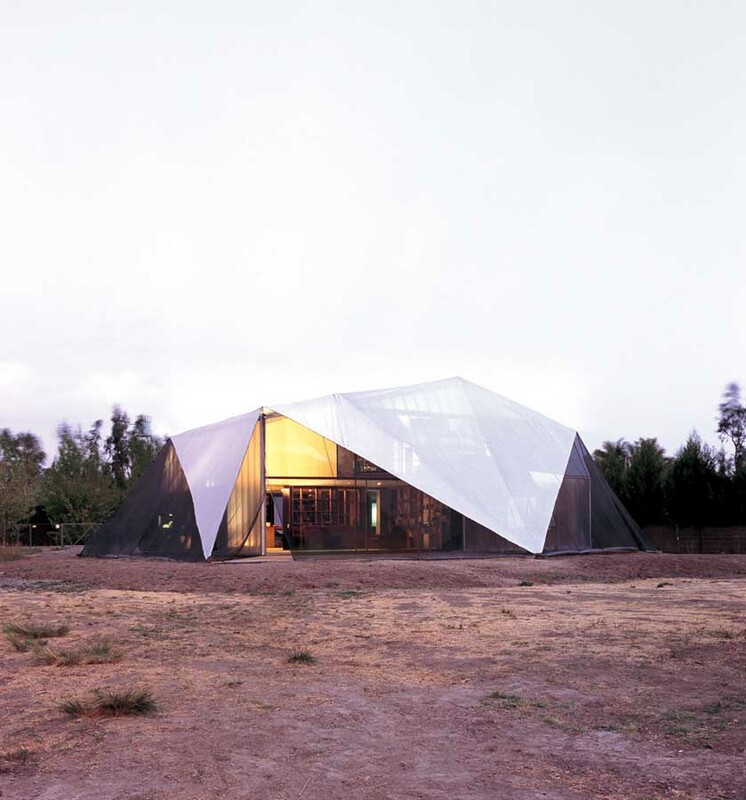 The winery’s design features a uniquely transparent, stretched fabric roof that allows for natural sunlight to permeate the winery and thereby to operate without artificial lighting. The entrance to the winery is an arresting visual display of a two-degree sloping plaza of running water streaming over the space, which provides an additional cooling element. Placed throughout the plaza of running water is a sculptural installation by Smiljan Radic and Marcela Correa, Chile’s inspired and talented husband and wife team. Walkways have been cut into the plaza, allowing visitors to walk through the water-filled landscape. The majority of the building is located underground to naturally cool the wine during the wine making process by maintaining a consistent temperature of 57 degrees using the natural thermal amplitude of the valley. 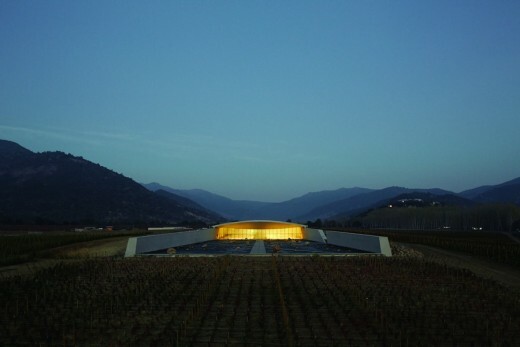 The fabric roof, the primary architectural element, which can be seen from the outside, gives the impression of an enormous white wing suspended over this underground winery. Perched on a hilltop in the center of the valley, Viña Vik boasts breathtaking 360-degree views across the 11,000 acre property. Featuring a floating, sculptural roof of bronzed titanium inspired by the surrounding mountains, the wind, and the work of Frank Gehry and Richard Serra, the hotel is visually arresting. This daring design is extraordinary and playful, and as with all Vik Retreats, completely unique and inspiring in its conception. 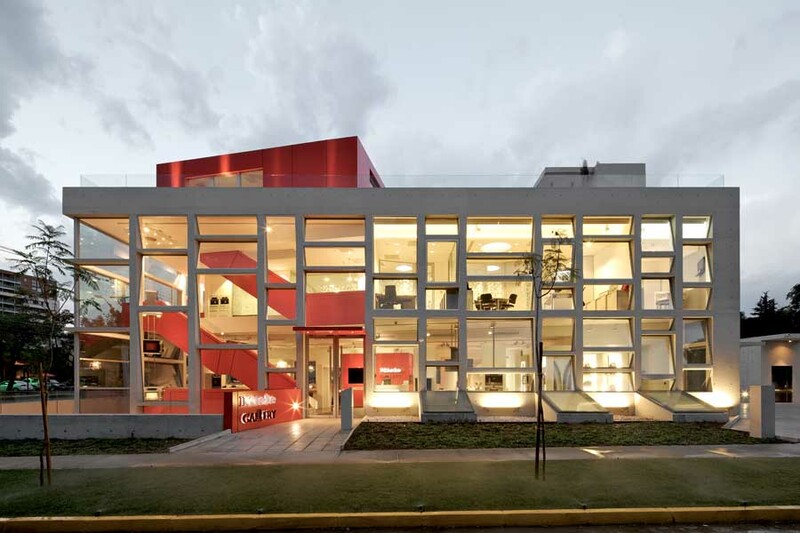 Guests are welcomed through a central open-format public living area and gardens. The convivial living room offers a wide range of art including works by Roberto Matta, one of Chile’s most beloved artists, and a diptych from Anselm Kiefer’s iconic “Secret Life of Plants” series. Beyond the living room, guests find a beautiful cantilevered slate pool extending out over the valley and lake below, providing the sensation of swimming above it all. The remarkable suites are marked by pioneering design and an extensive collection of artwork by Chilean and international artists. Each of the 22 suites features floor to ceiling glass windows with expansive views across the vineyard while also showcasing remarkable art and décor, ensuring a truly unparalleled guest experience. VIK and Viña Vik are accessible via the Santiago airport, which is serviced daily by flights from international airports throughout the world. VIK is located approximately 200 kilometers or 2 hours from the Santiago airport and is easily accessible by car.